I have an insatiable appetite for cookery books. I learned the basics as a child from my Mum and Grandmas in kitchens totally devoid of machines or recipe books. From them, I learned to value the tactile involvement in cooking, time management, appreciation of seasonal ingredients and budgeting. Continued experimentation as a newlywed taught me the worth of simplicity and choosing complementing elements wisely. I know if I devote myself to the task I will be pleased with the result. However, there is an enormous amount to learn about ingredients, seasonings and cooking methods and this is where my cookbook library comes in. The shelves are groaning with books dedicated to the regional cuisines of the world, dedicated to flavour combinations and cooking methods that have been developing for millennia but have only in the past 50 years spread to every corner of the globe. The foods of South East Asia are perfect for Australia’s summer and I have two new books for inspiration, “Vietnamese Home Cooking” by Charles Phan and “Asian After Work” by Adam Liaw. 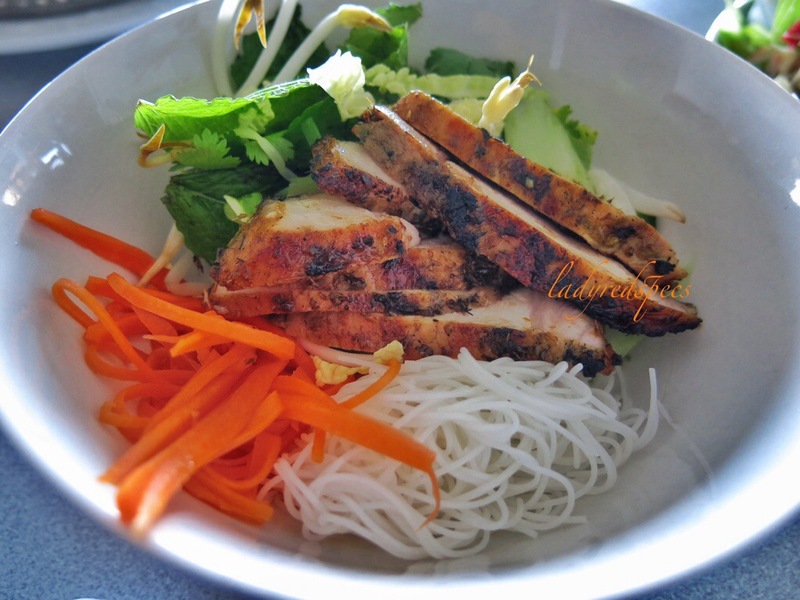 Using both books for guidance, but restricted by a limited pantry, I chose grilled lemongrass pork, to serve with rice vermicelli, pickled carrot and green herb salad in the “Vermicelli Bowl” style that Phan states is a popular lunch item all over Vietnam. A little nuoc cham sauce brought all the flavours into harmony. With leftover pork, noodles and pickled carrot I created a delicious rice paper roll filling to have for lunch the next day. Put all the ingredients in a blender jug and blitz until finely chopped. Smear the paste into the chops and marinate for a couple of hours. Heat the grill to a medium heat, then grill the pork until firm to the touch. Remove to a warm place and rest for 5 minutes. Slice the pork cutlets and serve with some plain rice vermicelli, pickled carrot, fresh herb salad and a generous drizzle of delicious nuoc cham dressing. Steep the carrots and/or radishes in the dressing for 20 minutes then drain and serve. Finely chop the garlic and chilli or pound in a mortar and pestle. 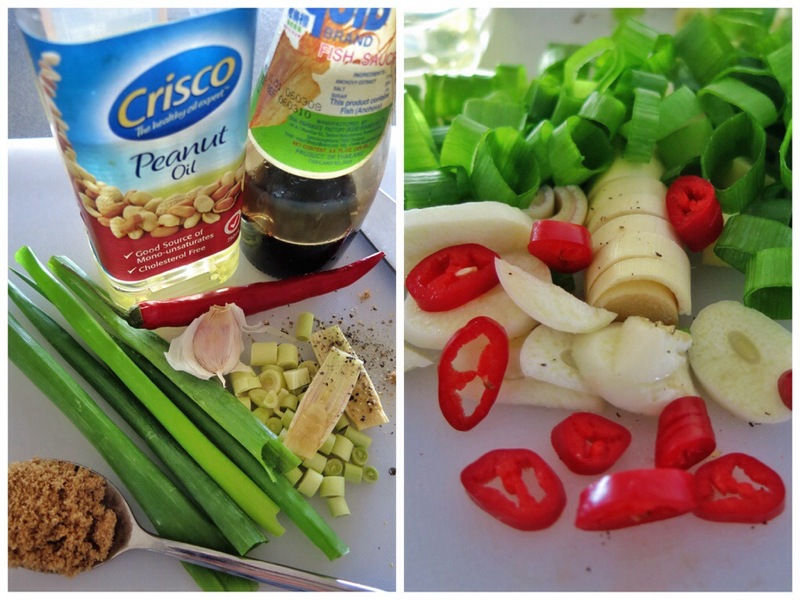 Mix together the fish sauce, lime juice and sugar, then add the garlic/chilli paste. “I have an insatiable appetite for cookery books” that’s great… I love your recipe! 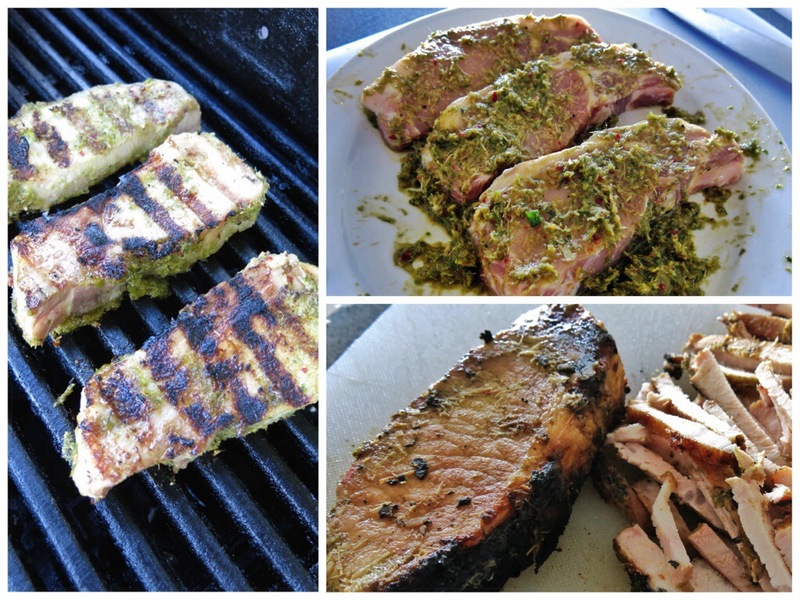 Thanks you it simple to prepare and adds a delicious flavour to the grilled pork. I’ve neve had lemongrass before moving in Canada (in Italy we don’t use it so often) this is why I’m always curious about recipes like yours! This sounds so good, on a hot day like today!! At least the sun has gone down! It’s finally cooling in Melbourne, it been a torrid few days! Have to try pork cutlets your way ~ the long, the short and the tall 🙂 !! Happy about your two new cookery book links – I have long had a moratorium about the purchase of such, but shall look up both and almost certainly buy Adam Liaw’s one: I am absolutely stoked that guy has done so well after Masterchef!!!! Liaw’s book is a winner, full of tasty quick Asian food! Reblogged this on The Gluten Free Recipe Club. This entry was posted on January 16, 2014 by ladyredspecs in FODMAP diet, Food, Gluten Free, Light Savoury Dishes, Main Meals, Marinades, Pork and veal and tagged barbeque, marinade, pork, Vietnamese.